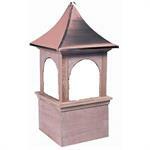 Wood, Aluminum, PVC or Vinyl Cupolas. Roof covering is standard in copper. Aluminum or no-covering is an option in many designs. Towers are available with louvers or glass windows. Copper or Aluminum Roof option. 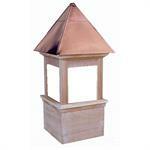 Copper or Aluminum Roof options. 78 standard models - Copper Roofs. Several Grid options. Sizes ranging from 12"w to 180" height. Available in sizes ranging from 12"w to 127" overall height. Special Order - Not returnable. 26" x 41" (Roof Width x Overall Height) Roof Pitch up to 12/12. Suggested for buildings 15 to 25' long. 29" x 51" (Roof Width x Overall Height) Up to Roof Pitch 15/12. Suggested for buildings 20 to 35' long. 22-3/8" x 30" (Roof Width x Overall Height) Roof Pitch 10/12. Suggested for buildings Up to 22' long. 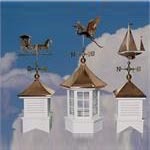 Sizing of Cupolas: Use 1-1/4" inches of cupola for every foot of unbroken roof-line. 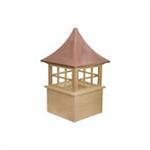 For 2 or 3 cupolas use 1-1/2" and for 4 or more cupolas use 1-3/4" of cupola for every foot of unbroken roof line.